Which is better? A podium microphone or a lapel mic? This is a difficult question to answer based on the variables; however it’s something to take into consideration the next time you plan on speaking to listeners. As you become a more proficient and confident public speaker, you’ll no doubt have the opportunity to use both podium microphones and lapel mics. Eventually, you will come to find that one simply works better for you (in most cases) depending upon your style of presenting and types of speeches you customarily give. Though you may not always have a choice as to which you can use, it behoves you to know the basic pros and cons of each type of equipment. Consequently, our quick guide below has been developed to help you decide which option to pick for your next public speaking engagement. Both podium microphones and lapel mics offer excellent volume if they are hooked up to dependable speakers or sound systems. That being noted, with either type of microphone, it’s ideal to test and mark your preferred volume level before your talk begins rather than risk irritating your audience members’ eardrums or forcing your listeners to read your lips. Podium microphones, which are stable and not attached to the body, tend to absorb less extraneous sounds than do lapel mics (with the exception of rustling papers.) For instance, if your starched collar or beaded necklace rubs against a lapel mic, it will usually pick up the “scratching” noises that a podium microphone would never capture. In terms of reliability, podium and lapel microphones are about neck-and-neck depending upon their ages and models. The newer (and usually pricier) the mic, the sturdier the material and the better the quality. If you’re considering becoming a professional public speaker, you might even want to invest in a model of your own. The lapel microphone, once attached, is far easier to use than a podium microphone if you’re the type of presenter who enjoys a “hands-free” experience onstage or in front of a crowd. For instance, with a lapel mic, a presenter can turn his or her head to the side, bend down, or walk into the audience without missing a beat. However, there are those speakers who rarely wander from their posts and basically stay in the same spot the entire time they are talking. For them, a podium mic is probably a better route, especially if it is ultra-sensitive and does not need to be practically “kissed” to pick up sounds. It takes more time to remove a lapel mic and affix it to someone else’s collar rather than simply turning a podium mic over to the next speaker. 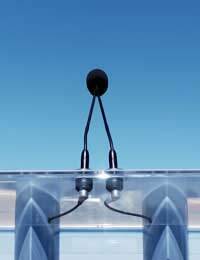 Thus, for events involving many sequential speakers, it’s usually more feasible to work with a podium microphone. Unless you’re taking the podium with you, the microphone will stay on stage with or without your presence. Therefore, it won’t pick up any backstage jabbering that you engage in. The lapel mic, though, is a different story… as some public speakers have discovered too late. Many anecdotes have been told about unsuspecting (and rather forgetful) public speakers wearing their lapel mics into the bathroom, thus most certainly giving the audience more than they bargained for!